Satellite facilities are available to broadcasters for down the line interview opportunities. Jaguar today make a major announcement; their partnership with Williams F1 to create the hybrid supercar, C-X75. 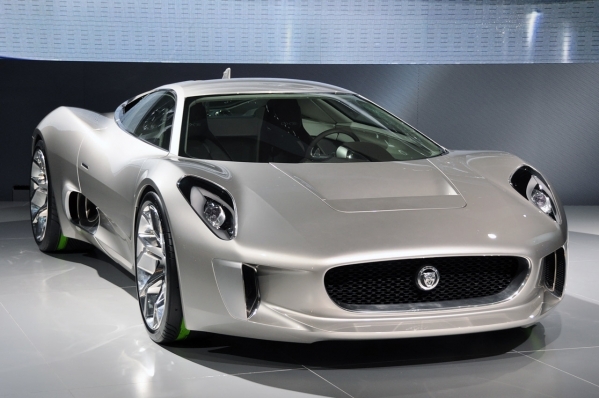 Jaguar C-X75 will become the British marque�s most advanced model to date. It will offer a performance on a par with the fastest production cars on the market, while adopting cutting-edge technology that offers remarkably economical running. It also marks a new milestone in both company�s histories as Jaguar Land Rover and Williams collaborate for the first time to produce one of the world�s highest performance and environmentally sustainable supercars. The production of Jaguar C-X75 will create more than one hundred highly-skilled jobs in the UK. VOLVO SPONSORS TRIP TO SWEDEN VISIT: www.CarPlusVacation.com. Vacations By Rail, a Chicago-based specialty travel company selling independent and escorted train vacations around the world, will participate in the fourth annual National Train Day on Saturday, May 7, 2011, with both online and live celebrations. National Train Day celebrates the nation�s love for trains. Join Vacations By Rail�s online celebration at www.vacationsbyrail.com and enjoy video programming about the history of the railroad from award-winning producer Richard Luckin; learn about the most popular train routes and unique rail vacations through podcasts with leading rail experts; and, enter to win a Grand Canyon Rails to the Rim trip for two including roundtrip tickets on Amtrak�s Southwest Chief, roundtrip first class train travel aboard the Grand Canyon Railway, guided motorcoach tour of the South Rim, hotel accommodations, and meals. Vacations By Rail will also have a booth at the live celebration taking place at Chicago�s Union Station on Saturday. For those local to the event, visit the booth to discover firsthand the company�s comprehensive collection of rail vacations throughout North America, Europe and beyond. For more information about Vacations By Rail�s independent, escorted, and luxury rail vacations, visit www.vacationsbyrail.com or call 877-929-7245 to speak with a rail specialist. Award-winning tour operator Austin-Lehman Adventures (ALA - http://www.austinlehman.com/), the active travel company setting adventure tours standards in The Americas, Europe, Africa and beyond, is honoring National Bike Month with a $200 donation to Wheels of Change, a non-profit charity, in the name of each person booking one of ALA�s dedicated biking tours this May. Wheels of Change provides donated bicycles to underprivileged African communities. Donations will help defer the cost of shipping 400 bikes, parts and tools. Through a community effort, ALA has collected the bikes and will pack them for shipment on Mothers� Day weekend. Collection of bikes, parts and tools began shortly after last year�s spring shipment of bikes to Ngoma, a remote village in the far eastern corner of Namibia. This year�s shipment will go to Nairobi, Kenya. Dan Austin, owner and founder of ALA, noted that a bike, that can change a life in a poor country, remains financially out of reach for millions. Wheels of Change helps empower people through improved mobility and access to food and water, employment, healthcare, education and social opportunities. For example, a healthcare worker can visit up to four times more clients by biking instead of walking; girls are 70 percent more likely to attend school if their household owns a bicycle; in 60 minutes biking can cover three times the distance of walking; a person biking can carry five times more than while walking. �The efforts of this organization will allow us to make a positive impact on the people who need it the most,� Austin said. The May shipment of bikes to Nairobi marks the first official initiative of the just-established nonprofit, Africa-based Wheels of Change founded by Michael Linke (http://www.benbikes.org.za/namibia/) and represented in Billings by Austin. Linke has helped establish 26 up and running bikes shops throughout Namibia, including the Billings-supported shop in Ngoma. Austin said that Wheels of Change has plans to expand geographically to other African countries as well as add new programs. One initiative allows solar lights to be shipped and sold at the bike shops. Another project is helping a young Namibia woman establish a bike tour company offering guided day trips to Katutura, the township area of Windhoek. Up to 400 bicycles can be loaded into one shipping container, along with tools and spare parts. The shipping container itself becomes a Bicycle Empowerment Centre (BEC) which in turn becomes a source of employment and revenue. A center provides refurbished bicycles free of charge to, among others, healthcare outreach volunteers and school children. Income from bike-related activities goes to assisting a sustainable business model while creating local jobs. Profits are reinvested in other community projects such as growing food for AIDS orphans, making micro loans to foster small enterprises, purchasing school uniforms, and paying school fees for disadvantaged children. Austin notes, there are plans to launch fundraising projects in the near future to help cover the cost associated with establishing BEC�s and adding additional services and products. People are invited to follow the progress on Austin-Lehman�s Facebook Page: www.facebook.com/austinlehmanadventures. May is National Bike Month: http://www.bikeleague.org/programs/bikemonth/index.php, with May 16-20 Bike to Work Week and May 20 Bike to Work Day. Austin-Lehman Adventures, with a 37-year legacy, provides adventure vacations on five continents, has built an international reputation for small group active travel to destinations in North, Central and South America, Europe, the Pacific Rim and Africa. The company specializes in adult and family multi-sport, hiking, biking vacations that emphasize history, culture and nature�s charms. Trips are limited to 12 guests (18 on family departures) and feature excellent regional dining, distinctive accommodations and all-inclusive rates and services. In addition to scheduled group departures, ALA offers customized trip planning. ALA offers each traveler a money-back satisfaction guarantee. For free 2011 catalog call toll-free 1.800.575.1540, or e-mail info@austinlehman.com. To review current trips, schedules and itineraries log onto: http://www.austinlehman.com/. SAVING MONEY AT THE PUMP: With some planning and preparing, it�s possible to maximize your fuel mileage so that you can have cost effective road trips in the coming months. Drive consistently and carefully: Avoid braking hard or accelerating unnecessarily quickly, you waste gas each time you accelerate just to brake a few seconds later. Do Your Research: Calculate how much a trip will cost in gas (you can use AAA�s gas calculator) and then compare it to bus, train or air fares. Cash not credit: Pay for gas with cash instead of charging it to a card, you�ll save a few cents per gallon. Sometimes you can buy gas cards at a discount on sites like Beezid.com. Fill �em up: Check that your tires are inflated according to the manufacturer�s recommended pressure. By maintaining well-inflated tires, you ensure your car is getting better mileage than on under-inflated tires. Invest in a GPS: Using a GPS cuts down on the chances of getting lost while driving to your destination which can waste time and gas. You can check out Beezid.com for deals on the latest GPS models. The one minute rule: If you�re going to idle your car for more than a minute, it�s worth turning off the engine. If it�s going to be under a minute, just leave the car running. The more, the cheaper: Try and carpool to destinations and split the costs of transportation costs. Quality goes a long way: Make sure to have your car or motorcycle inspected before you take a road trip, it�ll save you money to fix anything that might need repairs before your trip instead of potentially breaking down on the road which can become a costly inconvenience.